The costs of war are here made real, uncovered in the stories of those who perished and those who emerged from battle to find the world forever changed. Hitler's last gamble, the Battle of the Bulge, was intended to push the Allied invaders of Normandy all the way back to the beaches. The plan nearly succeeded and almost certainly would have were it not for one small Belgian town and its tenacious American defenders, who held back a tenfold larger German force while awaiting the arrival of General George Patton's mighty Third Army. 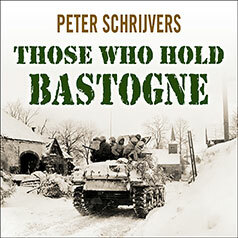 In this dramatic account of the 1944–45 winter of war in Bastogne, historian Peter Schrijvers offers the first full story of the German assault on the strategically located town. From the December stampede of American and Panzer divisions racing to reach Bastogne first, through the bloody eight-day siege from land and air, and through three more weeks of unrelenting fighting even after the siege was broken, events at Bastogne hastened the long-awaited end of WWII. Schrijvers draws on diaries, memoirs, and other fresh sources to illuminate the experiences not only of Bastogne's three thousand citizens and their American defenders, but also of German soldiers and commanders desperate for victory.